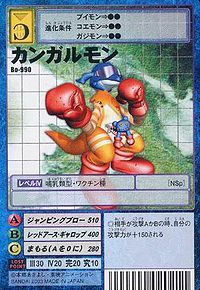 An Armor-level Mammal Digimon that evolved through the power of the "Digimental of Kindness". Its punching, kicking and jumping abilities are by far the best, and after it throws a diving uppercut at the opponent's chest using its nimble movements, it jumps up high in the air and unleashes an intense kick. It has a very cheerful personality, and for some reason it has been seen making light steps as if it were dancing on beaches. Its Special Move is an intense blow unleashed from its golden right arm (Jumping Blow). A Mammal Digimon that evolved due to the Digimental of Kindness. Special Move: An intense blow unleashed using its golden right arm (Jumping Blow). n., From kangaroo (「カンガルー」 kangarū), a large marsupial native to Australia. The name comes from the aboriginal language of the area and means "I don't know". Jumping Blow  ジャンピングブロー Jyanpingu Burō An intense blow unleashed from its golden right arm. 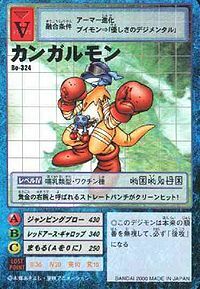 Kangarumon is only obtainable as a collectible card. Its card is part of the Digimental of Kindness (優しさのデジメンタル Yasashisa no Dejimentaru) set. 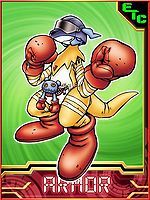 Kangarumon is available as a Digimon Medal. 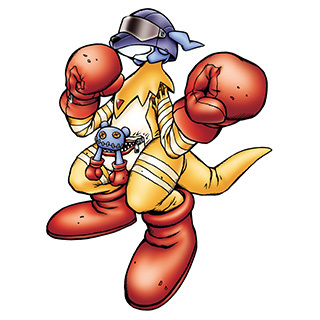 Evolves from V-mon with the Digimental of Kindness, and is one of the playable Partner Digimon. It lands a clean hit with a straight punch from its 'Golden Right Arm'! This page was last modified on 18 March 2019, at 22:05.